Last redesigned for the 2006 model year, the Kia Sedona minivan returns following a one-year hiatus. Kia believes that subtle styling changes, new wheels, revised storage areas, and additional standard features will give the aging model a new lease on life. Kia sells the 2014 Sedona in LX and EX trim levels. Standard equipment highlights include Bluetooth connectivity, a USB port, an auxiliary audio input jack, satellite radio, and air conditioning for the front and rear seating areas. Additionally, the Sedona LX is equipped with standard rear parking assist sensors, dark tinted rear privacy glass, power windows and door locks, a tilt steering wheel, and cruise control. A Power Package is optional for the LX model, adding a reversing camera, power sliding side doors, a universal garage door opener, an auto-dimming rearview mirror, automatic headlights, and aluminum wheels. The Power Package is standard on the Sedona EX, which is also equipped with upgraded exterior and interior trim, leather upholstery, heated front seats, heated side mirrors, a dual-zone automatic climate control system, a better stereo system, a power tailgate, and more. The Sedona EX can be optioned with a Luxury Package that includes memory for the driver’s seat and mirror settings, a power sunroof, power adjustable pedals, and rain-sensing wipers. A navigation system and a premium audio system are also available for the EX model. Kia equips the Sedona with a 3.5-liter V-6 engine rated to make 269 horsepower. A 6-speed Sportmatic automatic transmission features a manual shift gate, and delivers the power to the minivan’s front wheels. According to the EPA, the 2014 Sedona gets 17 mpg in the city, 24 mpg on the highway, and 20 mpg in combined driving. As this vehicle summary is written, neither the National Highway Traffic Safety Administration (NHTSA) nor the Insurance Institute for Highway Safety (IIHS) has rated the 2014 Sedona for crash protection. Previously, the IIHS tested the 2012 Sedona. 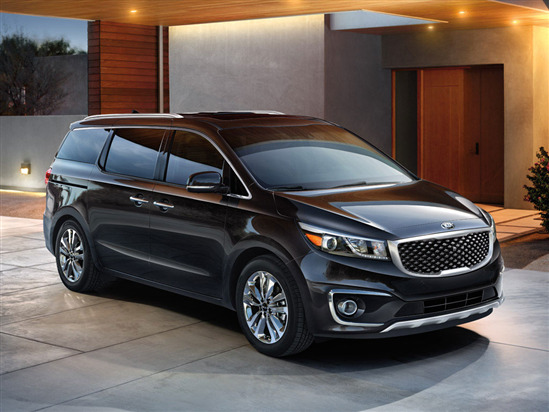 It received the highest rating of “Good” in all test assessments that year, except for roof crush strength, for which the van received the lowest rating of “Poor.” Unless Kia has made modifications to the Sedona’s roof structure for 2014, this unfavorable rating likely stands. The Kia Sedona is not a high-tech vehicle. Aside from Bluetooth and a navigation system, it is a simple vehicle. Kia even cancelled the formerly available rear-seat entertainment system for this 2014 re-boot.